When will 5G be ready? What will be the first applications for 5G? What will 5G devices offer? When will 5G devices be available? How does 5G deliver continuous connection, greater capacity, and faster speed and response times? 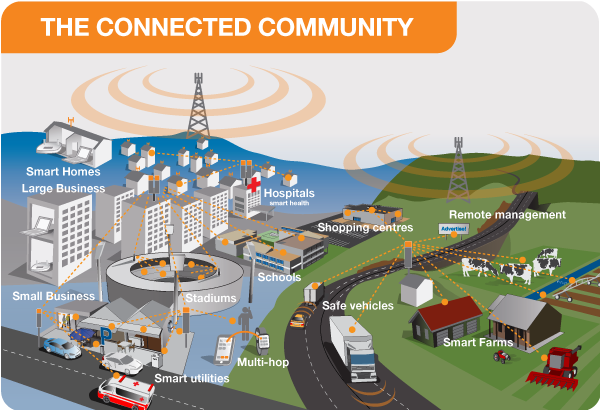 5G will enable instantaneous connectivity to billions of devices, the Internet of Things (IoT) and a truly connected world. 5G will provide the speed, low latency and connectivity to enable a new generation of applications, services and business opportunities that have not been seen before. Massive machine to machine communications – also called the Internet of Things (IoT) that involves connecting billions of devices without human intervention at a scale not seen before. This has the potential to revolutionise modern industrial processes and applications including agriculture, manufacturing and business communications. Enhanced mobile broadband – providing significantly faster data speeds and greater capacity keeping the world connected. New applications will include fixed wireless internet access for homes, outdoor broadcast applications without the need for broadcast vans, and greater connectivity for people on the move. 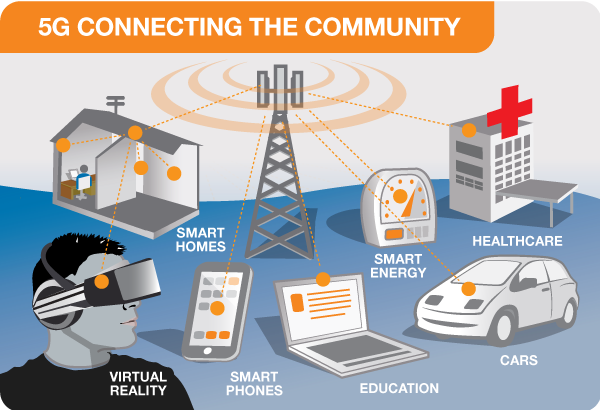 For communities, 5G will enable the connection of billions of devices for our smart cities, smart schools and smart homes, smart and safer vehicles, enhance health care and education, and provide a safer and more efficient place to live. For businesses and industry, 5G and IoT will provide a wealth of data allowing them to gain insights into their operations like never before. Businesses will operate and make key decisions driven by data, innovate in agriculture, smart farms and manufacturing, paving the way for cost savings, better customer experience and long term growth. New and Emerging technologies such as virtual and augmented reality will be accessible by everyone. Virtual reality provides connected experiences that were not possible before. With 5G and VR you will be able to travel to your favourite city, watch a live football match with the feeling of being at the ground, or even be able to inspect real estate and walk through a new home all from the comfort of your couch. 5G will keep us connected in tomorrow’s smart cities, smart homes and smart schools, and enable opportunities that we haven’t even thought of yet. 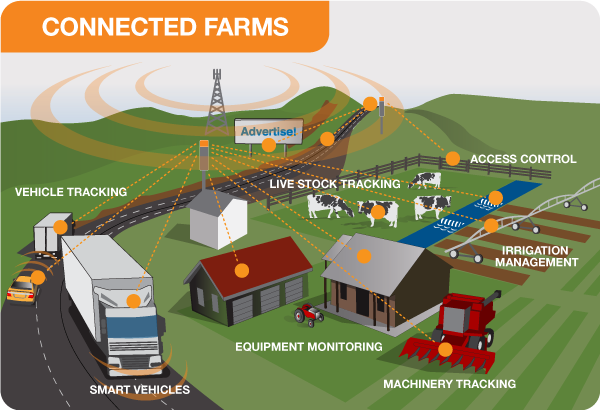 5G Enhanced Mobile Broadband and IoT will revolutionise agriculture and farming. 5G is currently being developed and trialled ready for commercial launch from 2020. Widespread availability of 5G services is expected by 2025. Fixed wireless access for homes and enhanced mobile broadband services are likely to be the first applications using new 5G wireless access modems and hot spots. The prime benefits of 5G devices will be significantly faster speeds in data access, downloading and streaming content. In addition, 5G devices will have increased computing power and make use of the lower latency, meaning that the devices will enjoy virtually instantaneous connections to the network, as well as greater connectivity when on the move due to the use of advanced antenna beam steering. Mobile handsets equipped with 3G, 4G and 5G connectivity are expected to become available in the 2020 – 2021 timeframe, and low latency and widespread machine to machine applications using 5G will be developed in the coming years. Most operators will initially integrate 5G networks with existing 4G networks to provide a continuous connection. 5G network architecture illustrating 5G and 4G working together, with central and local servers providing faster content to users and low latency applications. A mobile network has two main components, the ‘Radio Access Network’ and the ‘Core Network’. The Radio Access Network - consists of various types of facilities including small cells, towers, masts and dedicated in-building and home systems that connect mobile users and wireless devices to the main core network. 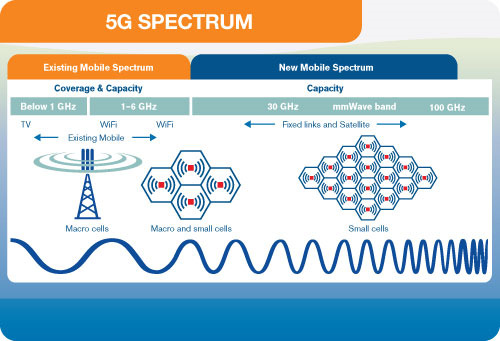 Small cells will be a major feature of 5G networks particularly at the new millimetre wave (mmWave) frequencies where the connection range is very short. To provide a continuous connection, small cells will be distributed in clusters depending on where users require connection which will complement the macro network that provides wide-area coverage. 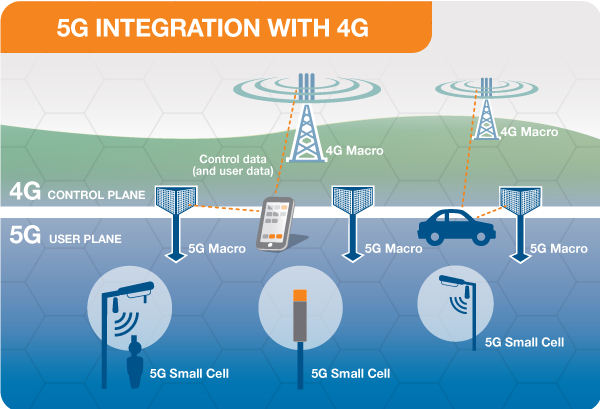 5G macro cells will use MIMO (multiple input, multiple output) antennas that have multiple elements or connections to send and receive more data simultaneously. The benefit to users is that more people can simultaneously connect to the network and maintain high throughput. MIMO antennas are often referred to as ‘Massive MIMO’ due to the large number of multiple antenna elements and connections however the physical size is similar to existing 3G and 4G base station antennas. The Core Network - is the mobile exchange and data network that manages all of the mobile voice, data and internet connections. For 5G, the ‘core network’ is being redesigned to better integrate with the internet and cloud based services and also includes distributed servers across the network improving response times (reducing latency). Many of the advanced features of 5G including network function virtualization and network slicing for different applications and services, will be managed in the core. The illustration below shows examples of local cloud servers providing faster content to users (movie streaming) and low latency applications for vehicle collision avoidance systems. Network Slicing – enables a smart way to segment the network for a particular industry, business or application. For example emergency services could operate on a network slice independently from other users. Network Function Virtualization (NVF) - is the ability to instantiate network functions in real time at any desired location within the operator’s cloud platform. Network functions that used to run on dedicated hardware for example a firewall and encryption at business premises can now operate on software on a virtual machine. NVF is crucial to enable the speed efficiency and agility to support new business applications and is an important technology for a 5G ready core. When a 5G connection is established, the User Equipment (or device) will connect to both the 4G network to provide the control signalling and to the 5G network to help provide the fast data connection by adding to the existing 4G capacity. Where there is limited 5G coverage, the data is carried as it is today on the 4G network providing the continuous connection. Essentially with this design, the 5G network is complementing the existing 4G network. 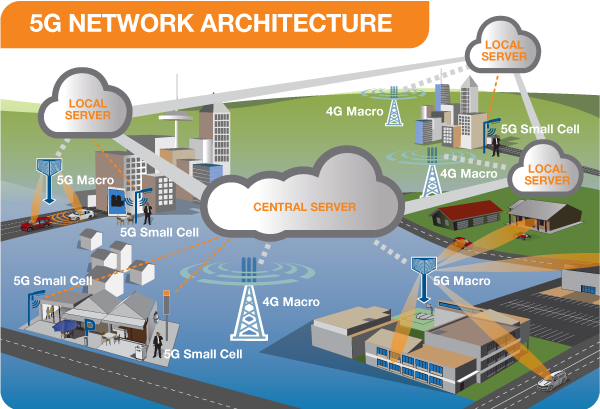 5G networks are designed to work in conjunction with 4G networks using a range of macro cells, small cells and dedicated in-building systems. Small cells are mini base stations designed for very localised coverage typically from 10 metres to a few hundred metres providing in-fill for a larger macro network. Small cells are essential for the 5G networks as the mmWave frequencies have a very short connection range. Initial frequency bands for 5G are proposed around 600-700 MHz, 3-4 GHz, 26-28 GHz and 38-42 GHz which will add significantly more capacity compared to the current mobile technologies. The additional spectrum and greater capacity will enable more users, more data and faster connections. It is also expected that there will be future reuse of existing low band spectrum for 5G as legacy networks decline in usage and to support future use cases. The increased spectrum in the millimetre (mm) Wave band above 30 GHz will provide localised coverage as they only operate over short line of sight distances. Future 5G deployments may use mmWave frequencies in bands up to 86 GHz. Mobile spectrum showing the radio frequency range from 3-100 GHz with new 5G spectrum above 6GHz. 5G will use ‘Massive’ MIMO (multiple input, multiple output) antennas that have multiple elements or connections to send and receive more data simultaneously. The benefit to users is that more people can simultaneously connect to the network and maintain high throughput. 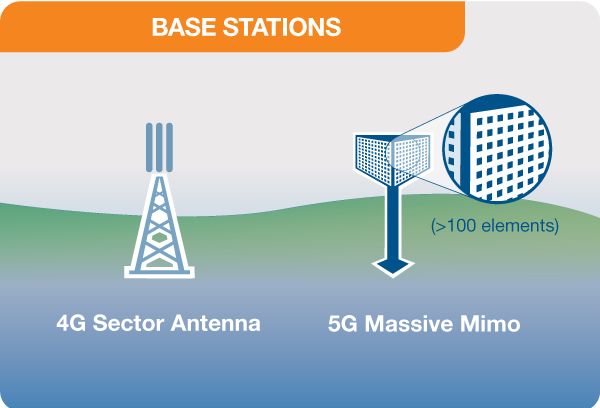 The overall physical size of the 5G Massive MIMO antennas will be similar to 4G, however with a higher frequency, the individual antenna element size is smaller allowing more elements (in excess of 100) in the same physical case. 5G User Equipment including mobile phones and devices will also have MIMO antenna technology built into the device for the mmWave frequencies. 4G sector base station and 5G base station with a new multi element Massive MIMO antenna array. The overall physical size of the 5G base station antenna is expected to be similar to a 4G base station antenna. 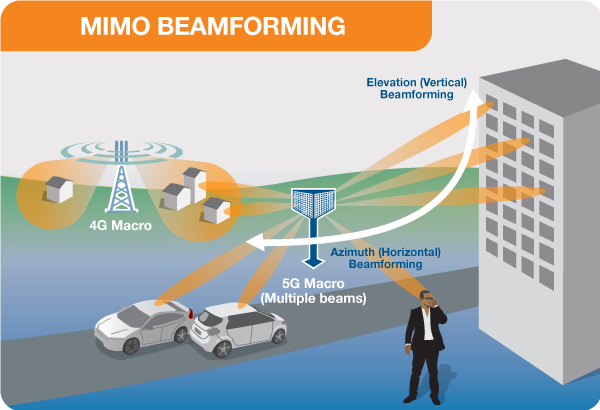 Beam steering is a technology that allows the Massive MIMO base station antennas to direct the radio signal to the users and devices rather than in all directions. The beam steering technology uses advanced signal processing algorithms to determine the best path for the radio signal to reach the user. This increases efficiency as it reduces interference (unwanted radio signals). Massive MIMO antenna and advanced beam steering optimises EMF and increases efficieny. Lower latency with 5G is achieved through significant advances in mobile device technology and mobile network architecture. 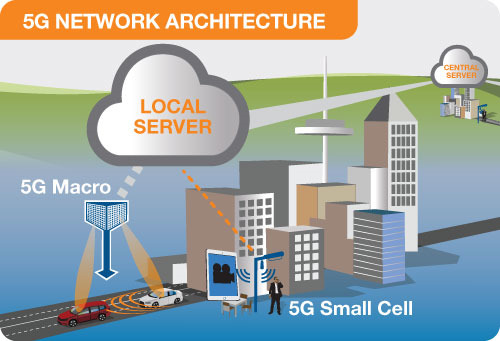 5G Network - Mobile Network Architecture Significant changes in both the Core Network (Core) and Radio Access Network (RAN) are required to deliver low latency. Core Network Changes With the redesigned core network, signalling and distributed servers, a key feature is to move the content closer to the end user and to shorten the path between devices for critical applications. Good examples are video on demand streaming services where it is possible to store a copy or ‘cache’ of popular content in local servers, so the time to access is quicker. Radio Access Network Changes To achieve the low latency, the Radio Access Network (RAN) will need to be re-configured in a manner that is highly flexible and software configurable to support the very different characteristics of the types of services that the 5G system envisages. Low latency and high reliability over the air interface requires new radio techniques to minimise the time delays through the radio within a few TTIs (time transmit intervals) along with robustness and coding improvements to achieve high degrees of reliability (e.g. one message is delayed or lost in every billion). Implementing a virtual, dynamic and configurable RAN allows the network to perform at very low latency and high throughput, but it also allows the mobile network to adjust to changes in network traffic, network faults and new topology requirements. What will be re-configured? The new architecture will exist as a 4G/5G split RAN where the user plane (5G) and the control plane (4G) are separate. This requires the separation of general purpose hardware and specialised network hardware. The functionality of general purpose hardware (nodes) are suitable for network functions virtualisation (NFV), where the specialised hardware in the RAN will become dynamically configurable.